With the new SMZ-171 Stereo Zoom microscope Motic introduces an optically improved addition to it's well established SMZ Stereo series. New materials for ESD compatibility as well as optimised LED illumination options have been added to this series to create a versatile Stereo microscope platform for a wide range of biological and material science applications. Switching from a macro overview down to micro details has never been easier than with the SMZ-171. One rotation of the zoom knob gives access to the complete magnification range. Five defined click-stop positions within the continuous zoom allow exact reproduction of magnifications. 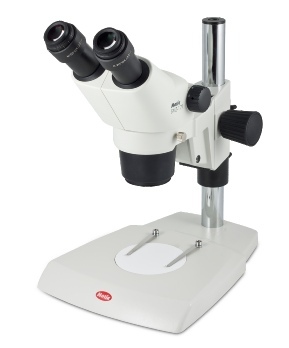 The 6.7:1 zoom ratio in the SMZ-171 enables a standard magnification range of 7.5X-50X. While zooming, a re-adjustment of the focus position is not necessary—as the complete optical system is designed for parfocality through the complete zoom range. 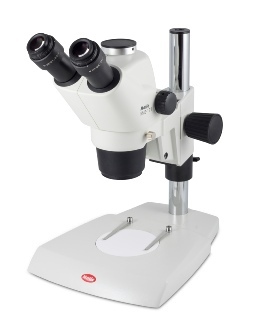 To increase the model´s magnification range a selection of auxiliary objectives and eyepieces are also available, extending the SMZ-171´s total magnification range from 2.25X up to 200X. 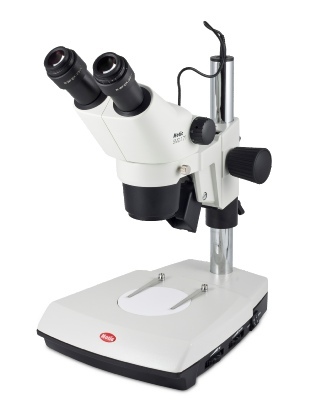 The optical heads of Motic’s SMZ-171 come as Binocular or Trinocular versions with 45° viewing angle, 10X eyepieces and a built-in 1X objective. A Binocular head with 60° viewing angle is available. The anti-fungus treatment of all optics allows the use of the SMZ-171 in humid environments. Motic offers a wide range of stands to be used with the SMZ-171. Both the classic pole stands (pole diameter version for electrostatic sensitive industries. Light is based on 3W LED light sources. Both LED illuminations can be activated simultaneously and adjusted separately. Designed with fiber-optic interface at the back of the Transmitted light base, the Motic cold light MLC-150 can be adapted additionally by a flexible light guide. By pulling a lever, a switch between both illuminations can be achieved. With a built-in reflector device, for Transmitted light the angle of illumination can be easily modified to meet the demand for oblique illumination. In addition to the standard illumination built into the stands a range of ringlight's (LED and fluorescent) and cold light sources are available for demanding applications, shadow free imaging or directional lighting techniques.